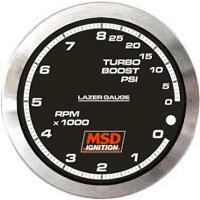 MSD Lazer Gauges UNIVERSAL - Dezod Motorsports Inc - Home of the automotive performance enthusiast since 2002. Introducing the MSD Lazer Gauge™! Never before has there been such a break through in gauge technology. Look closely at the face of the gauge and the first thing you’ll notice is that there’s no needle. Look closer and you can see that there’s no visible lights or LEDs in the background. This alone gives the Lazer Gauge™ a fresh and welcomed appearance in the form of gauges, but there is much more to the Lazers than meets the eye. The fastest reacting gauges with accuracy within 2 rpm at 10,000 rpm. Dual sweep readouts through a constant sweep LED. Touch screen programmable shift points or warning indicators. Backlit warning indication when over thresholds. Unique and modern appearance like no other gauges. Laptop programmable and built-in demo mode.